Collison was born in Orange City, Iowa and grew up in Fort Dodge and Iowa Falls. He attended Iowa Falls High School and was a McDonald's All-American in 1999. Teaming with fellow Iowan Kirk Hinrich to form one of the best duos in college basketball, Collison helped KU reach two consecutive Final Fours (2002 and 2003). Collison finished his college career as the leading scorer in the history of the Big 12 Conference (since passed). In 2003, his Jayhawks lost to Carmelo Anthony and the Syracuse Orange in the National Championship game, 81–78. He also played for the United States national team at the 2002 FIBA World Championship. Collison's #4 jersey was retired by the Kansas Jayhawks on November 25, 2003 during halftime of the Kansas-Michigan State game in recognition of his achievements over his four-year career (2002–03 Player of the Year, consensus first-team All-America, Big 12 Player of the Year). Collison was selected by the Seattle SuperSonics with the 12th overall pick in the 2003 NBA draft, but missed the 2003–04 season with injuries to both shoulders. He made his NBA debut on November 3, 2004, recording two points, five rebounds and two assists in a 114–84 loss to the Los Angeles Clippers. He appeared in all 82 games in his rookie season, averaging 5.6 points and 4.6 rebounds in 17.0 minutes per game. He played in all 82 games for a second time during the 2006–07 season. On January 9, 2007, he had a career-best game with 29 points and 21 rebounds in a 113–102 loss to the Phoenix Suns. In 2008, the franchise relocated to Oklahoma City and rebranded as the Thunder. In 2012, he helped the Thunder reach the NBA Finals, where they lost in five games to the Miami Heat. On February 3, 2015, Collison signed a two-year, $7.5 million contract extension with the Thunder. On July 21, 2017, Collison re-signed with the Thunder to a one-year, minimum salary deal. On May 10, 2018, Collison announced his retirement from professional basketball. On January 12, 2019, the Thunder announced that they would be retiring Collison's No. 4 jersey, becoming the first number retired by the Thunder. After the Sonics relocated to Oklahoma City, Collison continued to make his home in Seattle. Collison has a daughter named Emma. His younger brother, Michael, played college basketball for their father's alma mater, Briar Cliff University in Sioux City, Iowa. ^ "Nick Collison 2004-05 Game Log". Basketball-Reference.com. Retrieved July 2, 2018. ^ "Suns Win Seventh Straight, Beat Sonics". NBA.com. January 10, 2007. Retrieved July 2, 2018. ^ Gallo, Nick (May 10, 2018). "Seeing Off a True Pro – Thunder Fan Favorite Nick Collison Retires". NBA.com. Retrieved May 10, 2018. ^ "Thunder Set to Retire Nick Collison's No. 4". NBA.com. January 12, 2019. Retrieved January 13, 2019. ^ Need a view? Nick Collison's Queen Anne home "without rival"
^ "Super Sonic Wedding Superb! Doing it Right at Court in the Square, Hotel 1000, and Pravda!". JanetKlinger.com. August 20, 2007. Retrieved January 5, 2013. 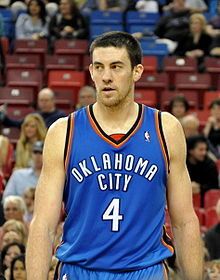 Wikimedia Commons has media related to Nick Collison.